There are so many layers to this interaction. Let me try to unpack them. The central concept is that there’s a liberal guy debating with Jesus and Paul, and he’s doing his best to get to a modern, moderate, and approachable version of Christianity. The liberal then tries to explain to the liberal audience that Jesus really didn’t mean that. He surely must have been speaking in metaphor, etc. Paul, one of the most respected people in all of the New Testament, then shows up and says the “unrighteous” will not inherit the kingdom of God, and he goes on to list what he means: the sexually immoral, idolaters, adulterers, and men that practice homosexuality. The liberal then looks again at the audience and says Paul didn’t actually mean men who practice homosexuality when he said those exact words. 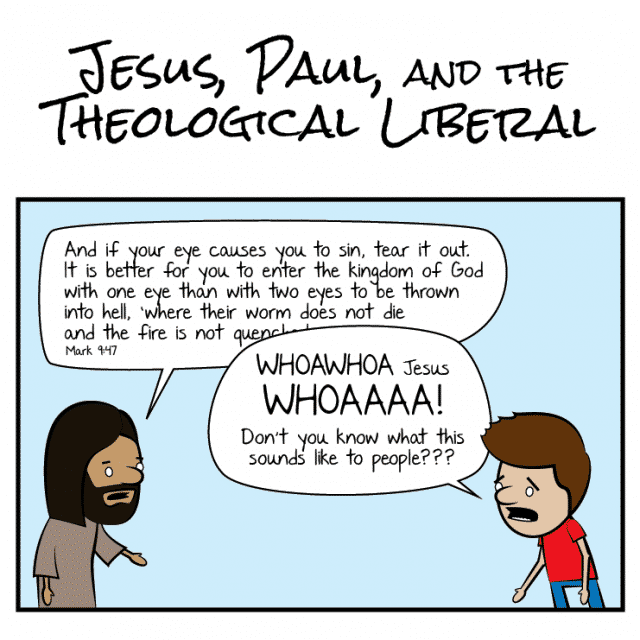 Jesus and Paul go on to clearly state a couple more things, like Paul saying that if you preach anything other than what he’s preaching, you should literally be cursed. I honestly don’t know if the cartoon is meant to be used to convince people on the fence to become atheists, or if it’s meant to convince moderate Christians to become more extreme, but my point is precisely that it does both. What’s so crazy to me is that I don’t disagree with my two fundamentalist friends on these points. I think their interpretations are quite right. Jesus absolutely taught that hell is a real thing, and that you’ll go there if you’re an adulterer, or if you’re gay. Their point to all of this is to say that Christians have lost their way. They used to be principled, moral, and God-fearing people who believed what the Bible taught—as it was written—not as interpreted by a left-leaning civilization thousands of years later. Well, I would agree with them if I accepted the truth, authority, and the goodness of those teachings. Which I don’t. It’s strange. Both of these friends are genuinely fantastic people. I’d even go so far as to say that they’re two of the kindest and most principled friends I have. They’re also smart, logical, and educated. The only thing that separates our viewpoints is that they 100% believe that the Bible is a book written by a supernatural being. And because they believe this, they think that homosexuality is immoral, and that homosexuals literally deserve to suffer an eternity of torment for being themselves. If you’re not frightened by this, you should be. I can think of no clearer demonstration of how poisonous religion is than to show you two smart, kind people in 2016 celebrating a cartoon that shows moderate religion to be wrong, and promotes without shame the notion that the solution is for everyone to embrace the original, extreme version. One of these friends told me a couple years back that homosexuality was like pedophilia—you don’t tolerate it just because the perpetrator feels compelled to do it. They’re both sins because they harm the world. The lesson that people should take from this is that when you’re dealing with a religion like Christianity or Islam, the extremists actually do have it right. They’re not wrong about what the books say. It’s the moderates who are wrong, because they’re the ones who’ve chosen not to read and follow what was actually taught. It’s for this reason, above all else, that dogmatic religion itself is dangerous—even in moderate form. What moderate religion does is force open a door that should never be opened in a modern society. It’s a door that represents the acceptance of moral truths based on supernatural fantasy, the acceptance of general claims without evidence, and a built-in resistance to the application of logic. Once that door is open for someone, and for a culture, it’s very hard to close. That’s the only explanation for how millions of people worldwide can think Jesus performed a tremendous sacrifice for humanity by dying, when according to the story he was alive for all eternity before that weekend, was only “dead” for a couple of days, and is now alive again for eternity after being resurrected by himself. Let us also not forget that he would have already known it was going to happen. So how much of a sacrifice is it when you saw it coming, could have stopped it at any time, and you actually aren’t even dead? Consider how offensive this is to the millions of humans have given their actual and only life just to save one person, with zero expectation of return. Once this nonsense invades the mind (usually by being forced onto helpless children) the opening is then there to hear the true, extreme version of whatever was taught, and that’s where the problems start. You don’t hear about it much because it’s not pleasant, but there are countless respected Islamic scholars who will tell you that ISIS is actually running their caliphate using a very pure and accurate interpretation of the Koran and of Islam. ISIS is not wrong in saying that they are following the original teachings. And neither are my two friends. The problem is not with them; it’s with what they believe. The long-term problem is that in a debate between an educated fundamentalist and some cherry-picking liberal trying to modernize original teachings, the fundamentalist will always win. The fundamentalist will win because they are right, and because they will always have the original core teachings to prove it. The plain truth is that, according to Jesus and his followers, the only true Christian is a fundamentalist one. You can’t change Christianity to fit your morality, because it’s not yours to change. Putting that another way, once you realize these religious teachings need to be altered to fit a modern, more enlightened sense of morality, you have to make a choice: accept the teachings fully or discard them outright. What fascinates me about this is how symmetrical our views are. If they just saw the world as I do they’d have exactly the same position that I expressed above. And if I only accepted the Bible the way they do I’d have their exact view on fundamentalism. The difference is what we accept to be true about the world. There are many great Christians who are both very tolerant/modern AND very devout. I know many in my industry of Information Security actually. What I’d say about them is that they, along with millions of others, have basically created their own Christianity inspired thing. It’s definitely based in some of the concepts, but it’s not true Christianity. And I think my friends above, along with most Christian scholars, would agree.